The Belize Table Tennis Association’s (BTTA) 2014 – 2nd Bi-Annual SMART Junior Ranking Tournament took place on the weekend of May 17-18 at the BES Auditorium, and once again resulted in great competition among players in the 3 junior categories – 12Under, 15Under and 18Under – with Amiri Hoare capturing the top prize in both the 12Under and 15Under categories, while Trevon Brown was victorious in the 18Under class. The tournament got under way on Saturday with the Round-Robin qualifiers in all categories, followed by the Double Elimination FINALS on Sunday. In the 12Under Category, some 16 players started out in 4 Round-Robin groups, with the top two from each group qualifying for the 8-Draw Double Elimination FINALS. 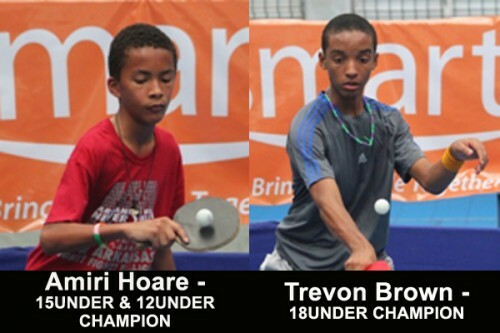 Taking the title in the 12Under Category was Amiri Hoare, who made it to the Finals by defeating Eric Li, Taye Parkinson and Jaylen Nicholson. 12Under Category: 1st – Amiri Hoare; 2nd – Jaylen Nicholson; 3rd – Terry Su; 4th – Samron Pott. The 15Under Category had the largest group of some 31 players in 8 Round-Robin groups, with the top 2 moving on to the 16 Draw Double Elimination FINALS. Challenging the bigger boys in this category, Amiri Hoare once again proved to be at the top of his game, defeating Alexis Tun and Luis Bardalez, before losing to Matthew Usher, which sent him into the losers’ bracket. Amiri fought back in that bracket by defeating Latrell Solis, Luis Bardalez and Matthew Usher, thus making it into the Finals against Joshua Gegg. Since Gegg was undefeated, Amiri had to beat him twice, which he did by similar scores of 3-1, to take the championship spot in that category as well. 15Under Category: 1st – Amiri Hoare; 2nd – Joshua Gegg; 3rd – Matthew Usher; 4th – Luis Bardalez. In the 18Under Category, 23 players were in 7 Round-Robin groups, with only one player from each group plus the best second place finisher advancing to the 8-Draw Double Elimination FINALS on Sunday. Top seed in this category, Latrell Solis made it to the Finals in the 18Under Category by defeating Asyel Lopez, Mario Galindo and Joshua Gegg. Trevon Brown defeated Gian Lisbey, before losing to Gegg, which sent him into the losers’ bracket. Brown fought back in that bracket by defeating Asyel Lopez, Gian Lisbey and Joshua Gegg; then went on to defeat Solis twice in the Finals by a similar score of 3-0, thus taking the 18Under title for 2014. Final results were as follows. 18Under Category: 1st – Trevon Brown; 2nd – Latrell Solis; 3rd – Joshua Gegg; 4th – Gian Lisbey. On hand to present trophies to all the top finishers was sponsor SMART’s Chief Marketing Officer, Mr. Anthony Mahler, who congratulated the BTTA for a successful tournament and for advancing the sport among the junior players. Membership Director, Mrs. Janine Carballo assisted with the presentation of the trophies, with the BTTA President Tux Vasquez delivering the word of thanks to all the participants, spectators, parents, organizers and especially the sponsor SMART for another successful event.